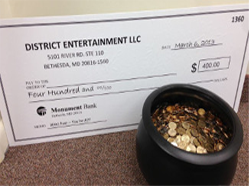 Every nightly trivia event in the District Trivia family participates in the Tournament of Champions, giving players and their teams a chance to win cash and prizes. This bi-annual tournament is a way for you and your team to be rewarded for doing something you love! (We assume that's playing trivia with us...). The winning TOC team takes home $1000 cash! There are two tournament seasons throughout the course of the calendar year - once in the summer (May-August) and once in the winter (November-February). The tournament runs concurrently with the normal trivia event, so teams and scores are automatically entered. All you have to do is show up and play trivia! For each tournament, there is a one week semi-final during the first week of September or March. Each TOC season culminates to a single night event - the TOC finals. You don't need to tell your host you want to be in the tournament - every team score is entered automatically. Keep your team name consistent during each qualifying month to ensure all points are accumulated properly. Tournament play and semi-finals take place at your home venue during the season. The finals are held at a specific venue. Because you're the best trivia players in the city, so you deserve the best prizes. Become Your Venue's Champion - For each month during the tournament, the team with the highest total cumulative score at each venue is crowned a semi-finalist for that venue. For example, during the summer tournament each venue will have a team qualify for May, June, July and August. The four qualifying semi-finalist teams from each venue will battle to be the one to represent that venue at the Tournament of Champions during a one night semi-finalist showdown. Teams that are finalist - 'Venue Champions' - start the TOC finals with 10 bonus points, so this is the best way to gain a head-start on the competition. Win a Free Pass - There are multiple ways to win a free pass. Top 10 Cumulative Leaderboard - If your team has one of the top 10 cumulative point totals at the end of the summer or winter season, you'll earn a free pass to the finals. Free Pass Night Winner - During the course of the Tournament of Champions, Free Passes are given away at special one night events held each week at one of the District Trivia venues. You can find out where the next free pass will be here. And many more! - We never know why, how or when, but new Free Pass opportunities will appear randomly. Follow us on Twitter and check our Free Pass page for the latest. Finally your knowledge of random things pays off. More questions? Check out our FAQs with more event details.